Merc, J. & Gális, R.
AG Dra is a well-known symbiotic system manifesting a characteristic symbiotic activity with an alternation of active and quiescent stages. Active stages consist of the series of individual outbursts repeating at approximately one-year interval. AG Dra persisted in quiescence since the 2006-08 major outbursts. 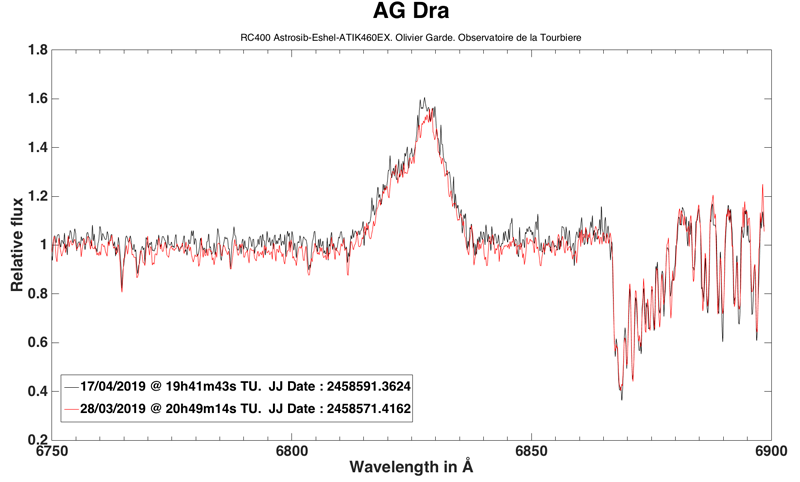 In May 2015, the brightness began to raise and the first, less prominent outburst (G0) during the new active stage of AG Dra was observed. It was followed by another three outbursts in April 2016 (G1), May 2017 (G2) and this year by the outburst in April 2018 (G3). We closely monitor the activity of this symbiotic system using photometric observations and data obtained from the AAVSO International Database. Moreover, outbursts in 2016, 2017 and 2018 were extensively spectroscopically monitored by the ARAS observers. Thanks to the high number of involved observers, a unique photometric and spectroscopic material have been obtained. For the first time, we are able to track the evolution of AG Dra with almost one-day resolution. So far the last observed outburst (G3) of AG Dra started in April 2018. The smooth increase of brightness was recognized at the beginning of the month (JD 2 458 211, B = 11.0 mag and V = 9.7 mag) and the onset of the new outburst was photometrically confirmed 11 days later (JD 2 458 222, B = 10.9 mag and V = 9.6 mag). The maximum was reached at JD 2 458 243 with a brightness of 10.2 and 9.5 mag in the B and V filters, respectively. According to the maximal brightness, it was a minor outburst of AG Dra. The increase of the He II/Hβ ratio (for the first time observed in the ARAS spectra from JD 2 458 223 and JD 2 458 227) as well as the increase of the equivalent widths of the prominent emission lines during the outburst suggest that this outburst was also of the hot type like the previous three outbursts in the present series. The brightness of AG Dra is gradually returning to the values typical for quiescence during July 2018. Photometric, as well as spectroscopic behaviour, suggests that all four recent outbursts of AG Dra belong to the minor, hot type. Such evolution of the active stage is very unusual because minor pre-outburst at the beginning of the active stages were typically followed by major, cool outbursts. The next evolution of AG Dra is still an open question. Can we expect (finally) a major cool or (again) minor hot outburst? Another possibility is, that the symbiotic system will return to quiescence. According to our statistical analysis of photometric observations, we determined that the time interval between outbursts of AG Dra vary from 300 to 400d (without an apparent long-term trend), with a median around 360 d. If there will be an outburst during the spring of 2019, we can expect it in the interval from JD 2 458 581 (April 7, 2019) to JD 2 458 625 (May 21, 2019). By this time we suggest to continue in the spectroscopic monitoring of AG Dra with a lowered cadence (one higher resolution spectrum per 14 days). The observation material obtained between the outbursts and especially in quiescence is important for the study of the material distribution in the symbiotic nebula and of the processes responsible for the outburst activity. New season for AG Dra monitoring. Waiting for a possible new outburst during spring, spectra are welcome in order to buid the baseline before outburst. 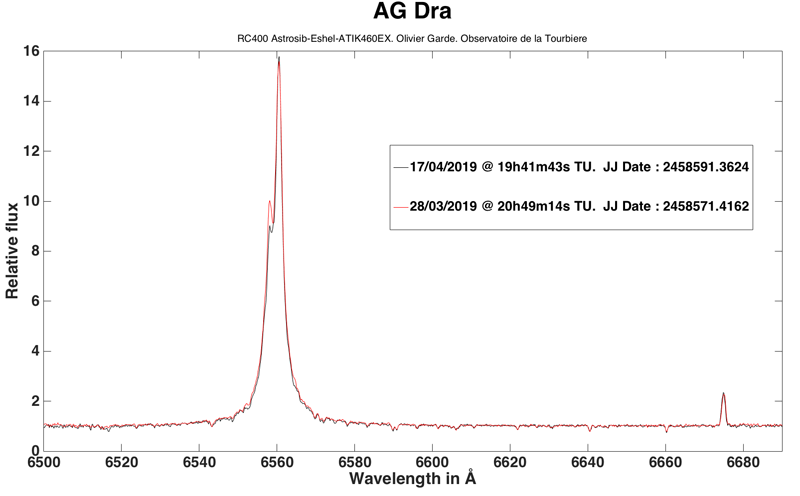 on the basis of our statistical analysis of photometric observations, we predict the time of next outburst of AG Dra in the interval from JD 2 458 581 (April 7, 2019) to JD 2 458 625 (May 21, 2019). A spectrum (low and high res) a day during the outburst, because the behavior can be complex. see notably He II and OVI Raman. I've detected the strange emergence of a line at 5018 A (once deduced the systemic velocity) during the outbursts. Last state of Ag Dra, a spectrum taken 2 days ago compare with my last observation the 28th March. Ma contribution, observation du 19.04.2019. Last edited by umberto sollecchia on Sun Apr 21, 2019 2:18 pm, edited 1 time in total. He II 4686 H-beta region with Lhires III and 1200 l/mm grating, 19/04/2019. The He II 4686 / H-beta EWs ratio is about 0.94. K giant absorption lines are clearly visible in the continuum. Here is my last contribution to the AG Dra monitoring.